MIUS (Muis) D’ENTREMONT, PHILIPPE, first Baron de Pobomcoup (Pubnico), near Cap de Sable, lieutenant-major, king’s attorney, settler, the first of the d’Entremonts of Nova Scotia; b. c. 1601 (or 1609) in Normandy (probably at Cherbourg); d. c. 1700 (or 1701). According to Placide Gaudet, the Norman Philippe Mius was related by marriage to the Bourbon family and was made Sieur d’Entremont by Louis XIV; but according to a descendant, H. Léandre d’Entremont, the titles of nobility are said to go back to the 11th century in Savoy, and a branch of the Savoy family is thought to have emigrated to Normandy during the 16th century. 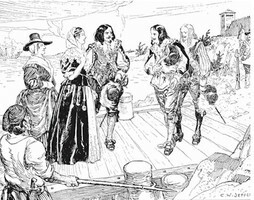 In 1649 the Sieur d’Entremont married Madeleine Hélie (or Élie) Du Tillet (b. 1626). He was then a captain in a regiment. It was in 1650 (Coll. de manuscrits relatifs à la Nouv.-France, II, 329) or 1651 (R. Le Blant) that he, with his wife and a daughter, was brought to Acadia by the new governor, Charles de Saint-Étienne de La Tour, a childhood friend, as lieutenant-major and commander of the king’s troops. To reward him for his services, La Tour offered d’Entremont in 1651 or 1653 the letters patent of the Pobomcoup fief, as a barony. The feudal rights conferred upon the baron a territory stretching from Cap Nègre to Cap Fourchu (Yarmouth). The feudal castle was built near the entry to the natural harbour of Pubnico, on the east side. Besides their daughter whom they had brought from France, the d’Entremonts had four children who were born on Acadian soil: two of their sons, Jacques, b. 1659, and Abraham, de Plemazais (or Plemarch), b. 1661 or 1662, married respectively Anne and Marguerite, the daughters of Governor Charles de La Tour and Jeanne Motin; the third son, Philippe, whose life is more difficult to piece together, evidently married a daughter of Jean-Vincent d’Abbadie* de Saint-Castin. As for the daughters, Marie-Marguerite, born in France, married Pierre Melanson, dit La Verdure [see Charles Melanson]; the other, Madeleine, seems to have remained a spinster. Around 1670, at the time when the Treaty of Breda was being put into force, Governor Andigné de Grandfontaine was establishing himself at Pentagouet on the Penobscot. D’Entremont was named king’s attorney, an office which he held for 18 years despite his advanced age. We know of reports which were made by Mius d’Entremont and Jacques Bourgeois* on the subject of the Acadian frontiers, and sent to the minister, Pontchartrain, by Joseph Robinau de Villebon. Towards the end of his life d’Entremont left his seigneurial estate, bequeathing the title of baron to his eldest son Jacques, and went to settle at Port-Royal with his wife and two of his children. He died at the end of 1700 or the beginning of 1701, a venerable patriarch more than 90 years old. According to tradition it was at Port-Royal that he died, but Léandre d’Entremont indicates Grand-Pré, where d’Entremont may have gone to reside with his daughter Marie-Marguerite Melanson, as the more likely place of death. Philippe Mius d’Entremont has left a large number of descendants in Acadia; the barony of Pobomcoup remained in the family until the expulsion of the Acadians; and after more than three centuries some hundred families of the same name can still be counted at Pubnico. Coll. de manuscrits relatifs à la Nouv.-France, II, 134, 329. Recensement de 1686 (Acadie). Placide Gaudet, notes preserved in the PAC and at the Université de Moncton; études published in Moniteur Acadien (Shediac, N.B. ), 17 Dec. 1886, 11 and 25 Jan. 1887. George S. Brown, Yarmouth, Nova Scotia: a sequel to Campbell’s history (Boston, 1888), 151–52. A. Cameron, study published in the Halifax Herald, 1 Jan. 1886, of which the translation was published in the Moniteur Acadien, 21 Jan. 1886; see also issues of 7, 14 Jan. 1886, 17 Dec. 1886, 11 Jan. 1887. H. L. d’Entremont, The Baronnie de Pombcoup and the Acadians, a history of the ancient “Department of Cape Sable,” now known as Yarmouth and Shelburne counties, Nova Scotia (Yarmouth, 1931); The forts of Cape Sable of the seventeenth century (n.p., 1938); study on the genealogy of the Acadian families of Yarmouth county, published in the Yarmouth Herald beginning 20 Feb. 1940. Robert Le Blant, “Les trois mariages d’une Acadienne, Anne d’Entremont (1694–1778),” NF, VII (1932), 211. Rameau de Saint-Père, Une colonie féodale, II, 320. P.-G. Roy, “Les marquisats, comptés, baronnies et châtellenies dans la Nouvelle-France,” BRH, XXI (1915), 48. Webster, Acadia, 121. Clément Cormier, “MIUS (Muis) D’ENTREMONT, PHILIPPE, first Baron de Pobomcoup,” in Dictionary of Canadian Biography, vol. 1, University of Toronto/Université Laval, 2003–, accessed April 26, 2019, http://www.biographi.ca/en/bio/mius_d_entremont_philippe_1E.html.